Here it is, the north portal of the Highline tunnel near Cawood KY at 36.78308, -83.24311. 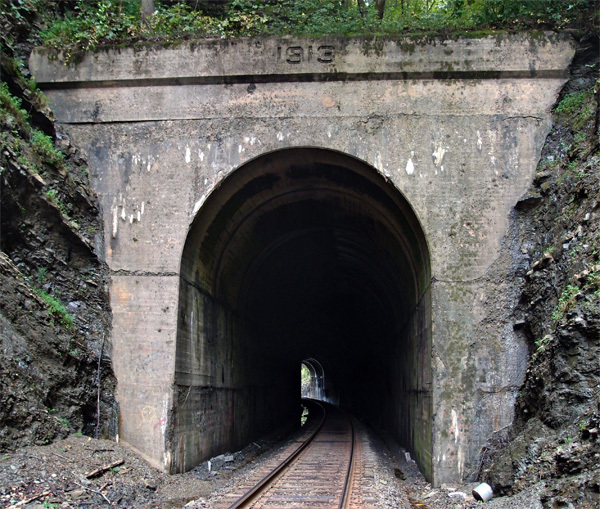 It’s one of three tunnels between Cawood and Smith KY (where Hagan tunnel’s north portal is). This one is a little over 1,200′ and curved, so you can’t see the other end from here. Note the lack of facing, indicating that the rock here is strong. The line is active. And, as you see from the mile marker, 251 miles from somewhere. 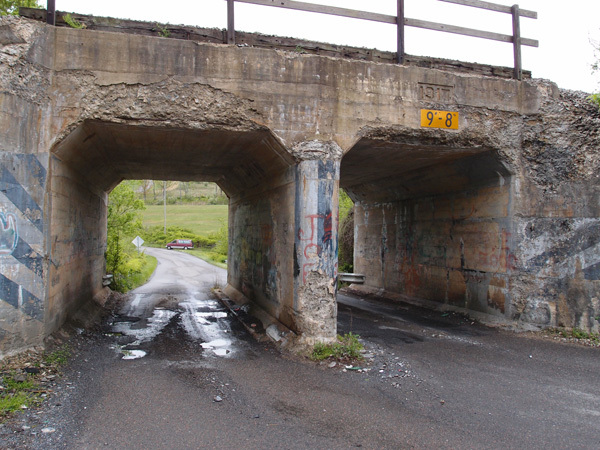 Go northeast on 38 from Harlan KY for just under a mile and you’ll see these tunnels. We didn’t know what to make of them, so, when I got back, I did a little research. They’re an Army job. 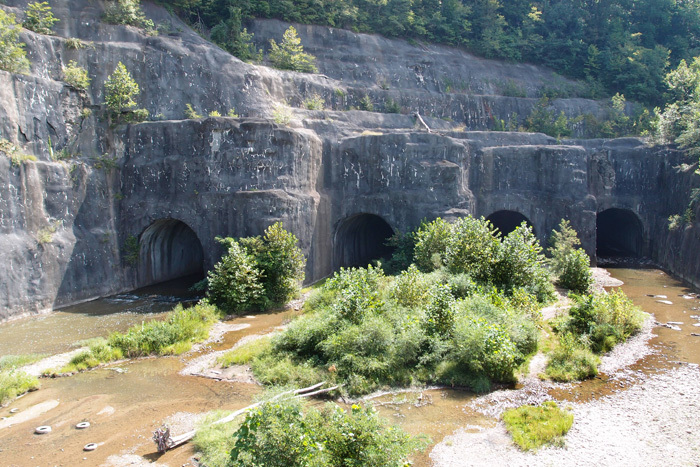 Finished in 1992, these four tunnels divert the Clover Fork of the Cumberland River away from downtown Harlan, where there had been a history of flooding, into Martin’s Fork. The tunnels here are at 36.85526, -83.31546. The one the left carries the most water, normally. The actual input portals are at 36.85125, -83.31086, about 2,000′ away to the northeast going under Ivy Hill. The four tunnels minimize the possibility that one will get clogged up with debris in a flooding situation. Those who canoe or kayak say that these tunnels are safe, with smooth bottoms and moderate flow. The rock around the tunnels has been sprayed with concrete to stabilize it. You never know what’ll turn up in Kentucky. I’ve bought a new negative/slide/print scanner. It does pretty good for the price ($109)(it’s an SVP)(China). While looking through some old color negatives, I came across this one that I’d taken maybe 25 years ago. This bridge, which spans the fabled Reedy Creek (as in that legendary perfume “Reedy Creek Mist”) and the Greenbelt, was replaced by the City a couple of years ago. I hope someone kept this. 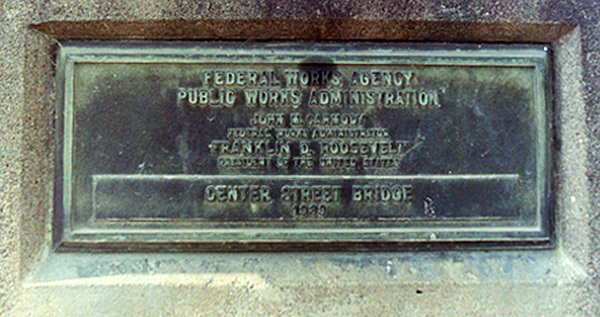 The plaque is hard to read in this resolution and size, but here’s what’s on it: Federal Works Agency/Public Works Administration/John M. Carmody/Federal Works Administrator/Franklin D. Roosevelt/President of the United States/Center Street Bridge/1939. Parlous times, those were. Probably quite a few men were damn glad to get a chance to work on this bridge. At this point, Highway 751 passes under the Norfolk-Southern line that comes out of Marion. The concrete on this underpass is beginning to show its age. Interestingly, there’s a wye at Glade Spring, just west of here. We’re at 36.79238, -81.74222, with the main highway behind yr. hmbl. photographer. The date “1917” is stamped into the concrete above the right underpass. Sensabaugh tunnel – Now In Color! As I began this tunnel project, I thought at one point that black-and-white pix might be the way to go. I was wrong. I’m now working to return to those three or four tunnels I’ve posted in b&w and repost them in color. The plan today (9/1/13) was to head up to Sensabaugh Hollow, scramble (again) up the fill to the railbed and retake Sensabaugh and Click tunnels, which are within a half-mile of each other. Now, we’d checked the radar and we had seen an area of rain moving in, but we figured it was at least thirty minutes or so away. Wrong again. Just after I finished taking the picture below, we heard thunder, turned around to look north and saw the storm moving in. We looked at each other and said, almost in unison, “It’s a washout!” We got back to the car just as heavy rain began. Sensabaugh, by the way, is the first tunnel on the CSX line going north from Kingsport (this is a southerly view). It gets its name from the small stream that runs down this hollow. Or from the hollow.